Milwaukee has been home to the Milwaukee Admirals since 1970. After memberships in the United States Hockey League and International Hockey League, the Admirals joined the American Hockey League (AHL) in 2001. Previously affiliated with the National Hockey League’s Chicago Blackhawks and Vancouver Canucks, the Admirals became the minor league affiliate of the Nashville Predators when the expansion team began play in 1998. 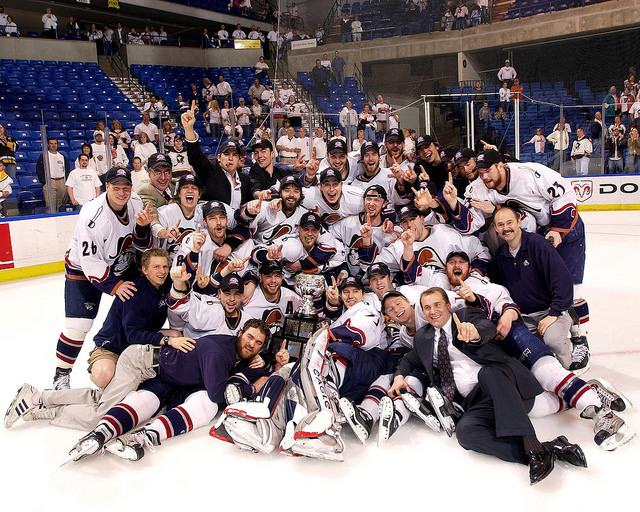 In 2004, the Admirals won the AHL’s Calder Cup, the franchise’s first professional championship. The Admirals played at the Milwaukee Arena (now the UW-MILWAUKEE PANTHER ARENA) until 1988, when their home ice was relocated to the Bradley Center (now the BMO HARRIS BRADLEY CENTER). ^ “Milwaukee Admirals Statistics and History (AHL),” hockeyDB.com, last accessed June 8, 2016. Broadcaster Lloyd Pettit and his wife, Jane Bradley Pettit, purchased the Admirals from appliance store owner Erwin Merar in 1976. The Pettit family sold the team to Harris Turer and a group of investors, including Milwaukee Brewers owner Mark Attanasio and general manager Gord Ash, in 2006. “Admirals History.” The Admirals Crew, The Admirals, History, http://www.milwaukeeadmiralscrew.com/adshistory.html, last accessed January 11, 2013. ^ “Milwaukee Admirals Statistics and History (IHL),” hockeyDB.com, last accessed June 8, 2016. ^ Amy Silvers, Katherine M. Skiba, and Tom Held, “Lloyd Pettit 1927-2003.” Milwaukee Journal Sentinel, November 12, 2003. Allen, Kevin. Star-Spangled Hockey: Celebrating 75 Years of USA Hockey. Chicago: Triumph Books, 2011. Dryden, Ken. The Game. Hoboken, NJ: John Wiley & Sons, 2005.